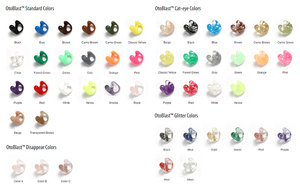 Westone Style 40 multipurpose ear plugs are an excellent choice for any high noise environment. The style 40 is very popular with shooting enthusiasts, heavy equipment operators, construction workers, and for those who must sleep with a snoring bed partner. Available as full-shell 40, full-shell shelled-out 40-6, half-shell 40-8, and canal only 40-4, our top recommended custom-fit sleep plug. 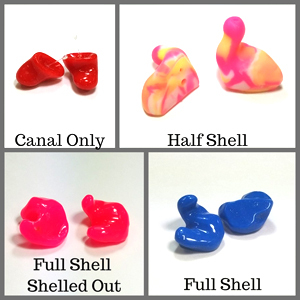 Westone Model 40 multipurpose ear plugs are made of Silicone OtoBlast material unless otherwise requested. Westone DefendEar Style 40 Custom-Fit Solid/Sleep Ear Plugs (NRR 24-29) (One Pair)5MikeMay 3, 2018Excellent product. Perfect fit. Effective. Wonderful, attentive customer service. Westone DefendEar Style 40 Custom-Fit Solid/Sleep Ear Plugs (NRR 24-29) (One Pair)5Russell L.October 17, 2016These are awesome. I've had them a long time. So long, that I shorted the wire and they fixed them ASAP. Customer service with earplugstore was awesome, too. I highly recommend going to an audiologist and having the impressions taken. You'll have a much easier time with fit. Westone DefendEar Style 40 Custom-Fit Solid/Sleep Ear Plugs (NRR 24-29) (One Pair)5Shannon KernOctober 1, 2016I give the quality of the customer service, instructions & product five gold stars! I HIGHLY recommend the Westone Defend Ear Style 40 Custom-Fit Solid/Sleep (Style = Canal-Only Sleep Plug 40-4 Coating = Standard Glaze Coating)! I've tried a number of different products to block out the sound of the loud snoring from my boyfriend. I'm a light sleeper, and I tried foam ear plugs that gave me an ear infection. I tried a noise-cancelling head wrap with head phones that were very uncomfortable. I tried ear putty with some kind of wrap that did not block out the sound. Then I found this product at the Ear Plug Store and works like a charm! Definitely worth the investment!! Not only are these things comfortable and effective at blocking out his snoring, I can hear my alarm clock just fine in the morning! The customer service is fantastic! They are friendly, helpful, efficient, and thorough! The kit instructions were easy to follow and the accuracy of fit was precise! I'm so thankful I get good sleep now! Do yourself a favor and buy this product!! Westone DefendEar Style 40 Custom-Fit Solid/Sleep Ear Plugs (NRR 24-29) (One Pair)2Mark CregerJuly 21, 2016DO NOT BUY THESE FOR SLEEPING!! My wife snores. I bought these so I could get some sleep. Followed the directions on how to make the custom mold of my ear canals to the letter. Shipping & manufacturing process was very easy. Ear plugs are labeled "L" and "R", so it is impossible to put them in the wrong ear. 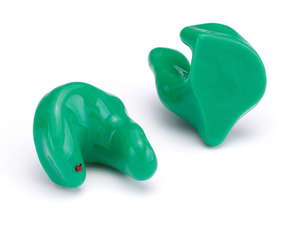 These ear plugs are great for wearing when I am sitting or standing up at loud events. BUT, they are painful when I am laying down and sleeping on my side. Also, the noise reduction of these is actually LESS than the cheap, orange foam ear plugs that I buy from any drugstore. Go to the drug store and buy those cheap foam ear plugs if you are wanting to deal with a snoring partner. Westone DefendEar Style 40 Custom-Fit Solid/Sleep Ear Plugs (NRR 24-29) (One Pair)1Deanna JohnsonMay 19, 2014For what I paid I really, really wanted these to work. They just don't block enough noise. My husband's snoring can still wake me up even when wearing the earplugs. They are not flexible enough and move around in my ear. They are fine for reducing noise, but not for sleeping. Westone DefendEar Style 40 Custom-Fit Solid/Sleep Ear Plugs (NRR 24-29) (One Pair)1MarkApril 8, 2013I had high hopes for these after reading the unanimous 5-star reviews. I went through three iterations of making molds, sending them in, and receiving earplugs. Each time, the earplugs were less comfortable and provided substantially less sound isolation than the foam earplugs I've been sleeping with for years. I found these earplugs to be very hard compared to my foam plugs, they never fit perfectly, and in the spots where they didn't fit they ranged from uncomfortable to downright painful. As for sound isolation, I do a little test with my foam plugs --- I lightly tap my middle finger against my thumb next to me ear and if I can't hear it I know the plug is in properly. These earplugs never passed this test and they were ineffective at blocking out the sounds of my bedmate. The only positive thing I can say about this experience is that the people at earplugstore.com were very professional; they provided quick answer to my questions and good turnaround time on remolds (up to the 90-day limit which I've now passed). Unfortunately they have a no-refund policy on custom earplugs so I'm out a fair bit of money for what I'm honestly going to end up throwing in the trash. Westone DefendEar Style 40 Custom-Fit Solid/Sleep Ear Plugs (NRR 24-29) (One Pair)5MissyNovember 1, 2012As a sign language interpreting student, it is vitally important that I protect my hearing. In the past I have used foam plugs from the store, or shooting muffs; they were all uncomfortable and didn't block as much sound as I wanted. My custom Westones are perfect! The custom fit means they sit perfectly in my ear so they are more comfortable and block out more sound. Not only are the ear plugs just what I was looking for, but the whole experience with earplugstore.com was fantastic. Everyone I dealt with was very helpful, and both my impression kit and my finished plugs were shipped very quickly! Westone DefendEar Style 40 Custom-Fit Solid/Sleep Ear Plugs (NRR 24-29) (One Pair)5TammyDecember 22, 2011I was a little hesitant about getting fitted ear plugs. But, I figured they were better than the type you try to stuff in your ear...and eventually fall out. The price seemed a little high to me but I was willing to give it a shot. I am glad I did. I really like my custom fit ear plugs. The only thing I wished I had done different has to do with the molding. My husband did a good job pulling out the syringe as it filled my ear for the first ear. But, the second ear was "filled" more than the first and consequently that ear plug is a little more snug and kind of uncomfortable. It's not bad enough for me to return them because I am enjoying the peaceful sleep I am getting. I have only had them for two nights and I can already tell I am sleeping better. Westone DefendEar Style 40 Custom-Fit Solid/Sleep Ear Plugs (NRR 24-29) (One Pair)5MahaApril 26, 2011I've gone from store bought foam earplugs to these custom earplugs. Wow, what a difference. The best thing about them is that they don't hurt like the foam ones since they're made to fit my ears. I'm not having any headaches, I'm getting a good night's sleep and best of all, I don't hear my husband's snoring or loud breathing! I was a little unsure about these since the nrr is 29, vs. 33 for the foam ones, but because these are custom made for my ears, they fill in all the gaps, so are better for blocking sound than the foam ones. I can still sleep on my side because I got the canal only style. They're very comfortable and I can't recommend them enough. I wish I'd bought these 10+ years ago!